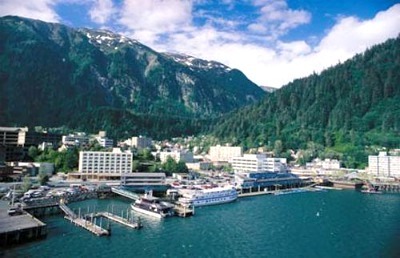 The state capital of Alaska, Juneau is one of the most beautiful and famous cruise destinations in North America. Founded in 1880 after a major gold strike in the vicinity, Juneau's early history was strongly associated with this precious metal. Today it is a modern, bustling city dominated by the industries of state government, tourism and air transportation. Nestled between the gray-green waters of Gastineau Channel and the spectacular Juneau Icefield, this cruise port offers visitors some of the most stunning scenery in the region. Juneau's cruise ship dock is located on South Franklin Street, at the southern end of the downtown area. From there it is only a few blocks walk to the Chamber of Commerce, the central business district, state government offices, and most of the popular gift shops. Juneau's harbor can be extremely busy during the summer months, and often cruise ships will remain in the channel and ferry passengers to the tourist docks. Taxi service is available and many city tours that are pre-booked by travelers leave from this location. For those visiting Juneau the list of sightseeing attractions is nearly endless. 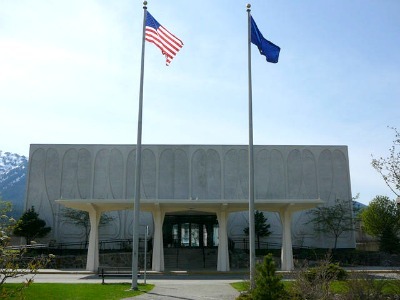 The State Museum offers tourists a first rate look into the history of Alaska, with beautiful exhibits highlighting the native culture of the Tlingit and Chilkat tribes, totem poles, Alaska wildlife and of course the glory of the gold rush days. 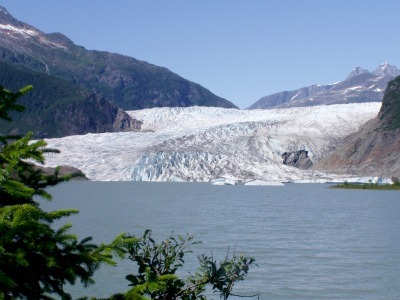 In nearby Mendenhall Valley, visitors can get an up close look at the famous Mendenhall Glacier and examine the geological history of this area on one of the many nature trails. For a truly exciting adventure, visitors are encouraged to take a short flightseeing tour above the 1,500 square mile Juneau Icefield and get a first hand look at this remnant of the last ice age. North of the downtown area and along Glacier Highway are a number of picturesque beaches with spectacular view of the distant Chilkat mountain range. Alaska Native Arts and Crafts operates a store that offers the finest in authentic native clothing and accessories. Juneau has a good number of fine restaurants that serve up everything from king salmon steaks to halibut filet, king crab and Petersburg shrimp. Most of these establishments are in the downtown area, as are the large number of bars and taverns, some of which are registered as Historic Places and are tastefully decorated in the style of the gold rush era. More traditional cuisine, such as steaks, burgers and pizza is available at a variety of establishments; most of the area hotels have a full restaurant and bar. Many cruises to Juneau and the Alaska panhandle include city tours that pick up visitors right from the cruise docks. For those making their own way around the city, there are several taxi services, the Capital Transit system and limousine rentals. Visitors wishing to rent a car may do so through a number of agencies and pick up their vehicle either downtown or at the Juneau International Airport. The Chamber of Commerce and most gift shops have complete road maps of the area either free or for purchase. Juneau has a moderate climate that is quite wet for much of the year; adequate raingear is essential when visiting this part of the state. For those wanting to make cell phone calls or use wireless Internet during their stay, Juneau is well connected and visitors should have no problems with reception. There are a number of ATMs and banks in the downtown area for those needing cash or to obtain traveler's checks. The beautiful Juneau, resting between the mountains and the sea. The Mendenhall Glacier, perhaps the most famous site near Juneau. This unassuming building houses the State Museum where you can find a lot of interesting stuff. 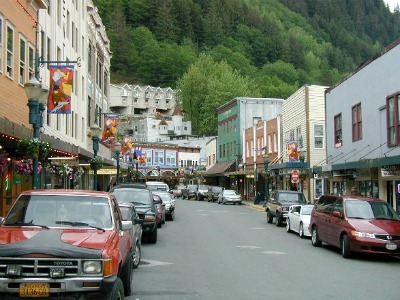 A typical street in Juneau lined with small diners and restaurants as well as souvenir shops where you can find great Alaskan memorabilia.